StitchyDonDesigns: It's My Birthday and I'll Post if I Want To !!! So today I turn 32 and I am having a lovely day but I wanted to make a quick post about my present from my mother. 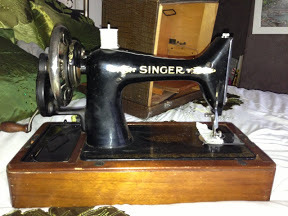 I have always wanted an original Singer hand turning sewing machine just like my gran had when I was little (we don't know where her machine went). We have a local charity shop that I go in all the time to look at them as they sell a few of them. My mum said she would get me one for my birthday. The shop had sold out of them the last couple of trips I went to, so I was soooo pleased to have got it as it was one I saw about a month ago that I showed my mum (unknown to me she went in the next day to buy it). It is in immaculate condition, has an original hard case and instruction manual. It is probably from approx. 1930. You won't believe how much she paid ..... £25 ....... Amazing price !!!! I am soo happy I can't wait to have a play on it. Happy birthday! The sewing machine looks marvelous! My mom had one like it while I was growing up--originally manually powered with a rocking foot pedal but converted into an electric-powered model. Happy birthday! Love your sewing machine...and what a bargain price too! Happy Birthday. What a great present. Happy Birthday, Donna! Enjoy your brand new 80-year-old toy! Oh what a lovely birthday present! That is probably the best sewing machine ever made! It will last forever. Enjoy it.